At the beginning of the school year (or any time) you can get to know your students much better by having them complete a “get to know you” form. 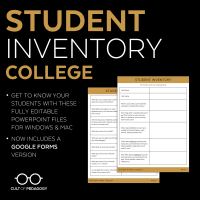 For this purpose, I have created a collection of Student Inventories—one for each of four different age levels—that ask important questions about students’ interests, home lives, learning history, medical and health issues, and other information that will help you be the best teacher for them. Early-grades forms are written in simpler language and address more basic topics; forms for the older grades address transportation issues and responsibilities outside of school, and ask more sophisticated questions about learning preferences. Each printable form is available for $3.00 from my Teachers Pay Teachers Store, is FULLY EDITABLE, and can be re-used every year. 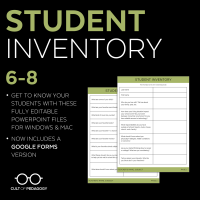 They also come in a Google Forms option which you can use in your own Google Drive and collect responses electronically. Click on the images below to go to each product’s page, where you can see a full preview of the questions on that form.